NETWORK UPDATE: FOX’s Utah vs. USC COLLEGE FOOTBALL game rose 0.2 to 1.0, while ABC’s Ohio State vs. Rutgers game stayed at 1.6. 48 HOURS also gained 0.1. CABLE HIGHLIGHTS: This being a fall Saturday, 6 of the day’s Top 10 were COLLEGE FOOTBALL (topped by 0.93 for ESPN’s primetime game) or other sports-related programming. Adult Swim’s anime block in the middle of the night remained solid: DRAGON BALL Z (not on the chart as a quasi-original) slipped 0.02 from last week to 0.72 with 1.48M total viewers; AKAME GA KILL downticked to 0.58; PARASYTE slipped 0.03 to 0.47; MICHIKO & HATCHINI was steady at 0.42/910K; NARUTO fell 0.03 to 0.37/783K; and ONE PIECE was also down 0.03, to 0.34/681K. (We don’t have a listing for KILL LA KILL this week.) Elsewhere, Spike’s COPS gained 0.08 to 0.49. 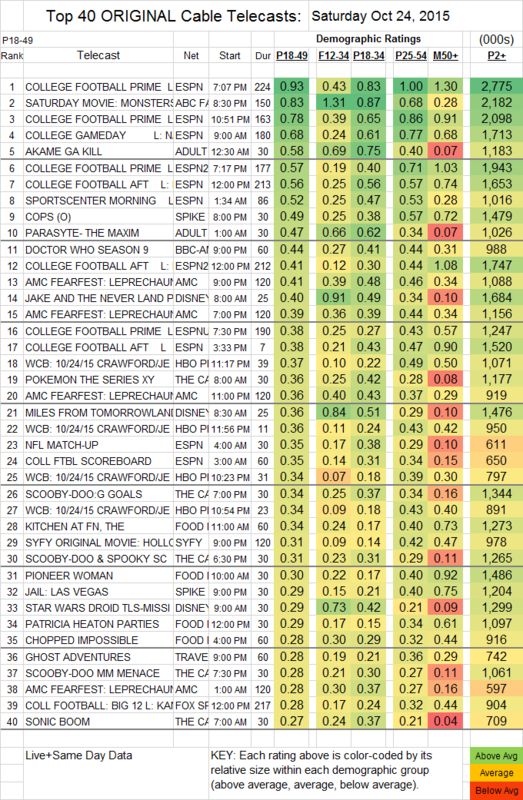 On BBCAmerica, DOCTOR WHO jumped 0.13 to 0.44, and THE LAST KINGDOM more than doubled, up 0.08 to 0.15. Syfy’s original movie THE HOLLOW was at 0.31, Hallmark’s original GOOD WITCH HALLOWEEN was at 0.27, and BET’s original SISTER CODE was at 0.26. On Starz, the season finale of SURVIVOR’S REMORSE almost doubled, up 0.07 to 0.15, but the season finale of BLUNT TALK fell 0.01 to 0.04 (161K total viewers), while the final season premiere of DAVINCI’S DEMONS was at 0.07/238K.